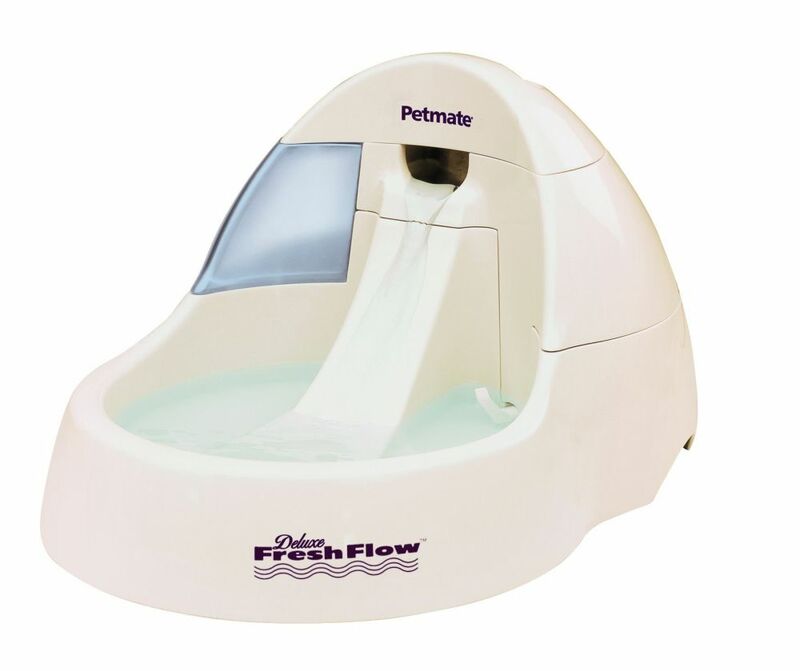 The running water in the Fresh Flow Deluxe is always fresh and full of oxygen. Cats prefer to drink this kind of water. The constant flow of the fountain will encourage your cat to drink more and the increased daily intake of water will improve your pet's vital kidney functions. To operate Fresh Flow Deluxe: Fill the reservoir up to the top water level mark with fresh water Plug the Fresh Flow Deluxe into a conventional socket The integrated pump quietly pumps the water out of the reservoir and filters it through an internal, easy to replace filter. The freshly filtered water runs like a waterfall out of the upper part of the Fresh Flow Deluxe over a ramp and then back into the reservoir - quietly and without splashing. The water remains clean and pure and is lightly chilled. The internal charcoal filter eliminates harmful bacteria in your pet's water which helps to prevent illneΒ. The water container is transparent so it is easy to see how much water it contains. The pump is completely silent. For 230V/12V Power Sockets, with power supply. CE and GS tested, maximum safety. Clean by hand with mild detergent and warm water. Operating Instructions with diagrams as well as cleaning instructions Please note: This device is designed for use in Germany and thus comes with a power adapter for use in the UK. Important information: Fresh Flow Deluxe must be regularly cleaned so that cat hair and hard water (scale) do not impair the the pump function. To de-scale: lay the pump in de-scaling mixture for approx. 2 hours, then wash the pump by hand once more before placing back into Fresh Flow Deluxe de-scale every 2-4 weeks depending on hardneΒ of water. No warranty on pumps with scale. New individual pumps are available for separate purchase. Please take care to keep the water reservoir full. The pump should never run dry - this also voids any warranty Dimensions: approx. 30cm long approx. 23 cmwide (at the back, narrower at the front) approx. 15.5cm high Electric cable length: approx. 175cm What's this?. Price just £25.99! Click here to buy now!